What comes to mind when you think of Jamie Lee Curtis and John Carpenter? Halloween, dumbass. Of course, Halloween. Often overlooked though is The Fog, which again paired Carpenter and Curtis, along with several other Halloween cast and crew members. The Fog revolves around the coastal town of Antonio Bay, which is getting ready to celebrate its 100th anniversary. Unbeknownst to most of the residents, the town holds some dark secrets. When a seemingly harmless fog rolls in, people start dying at the hands of ghostly creatures out for revenge. What crime did the town commit and who are these murderous apparitions? Rent the damn movie, fer crissakes! Seriously though, rent this. It's great. Carpenter does an excellent job of creating a creepy atmosphere and the whole cast is great as well. Jamie Lee Curtis and Tom Atkins (Halloween 3) make a great duo trying to uncover the truth of the fog. 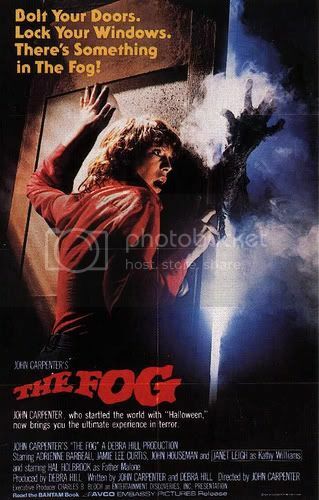 Adrienne Barbeau (who was married to Carpenter for awhile) also does an excellent job as radio DJ Stevie Wayne, warning the townspeople of the fog's whereabouts from her radio station at the top of a lighthouse.